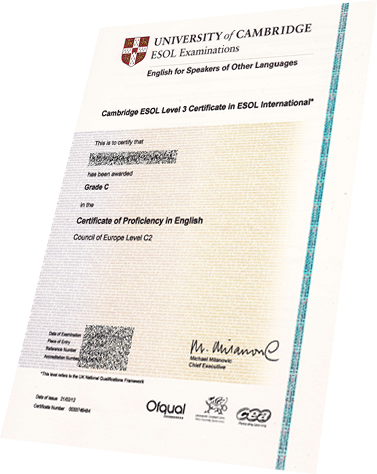 The Certificate of Proficiency in English or CPE is an advanced exam run by Cambridge Assessment‏‎ aimed at people who use English for professional or study purposes. Many employers, universities and government departments all over the world officially recognize the CPE as proof of proficiency in English and it is a popular exam to take after the Cambridge First Certificate. It is equivalent to the C2 level of the Common European Framework of Reference for Languages. The exam is considered passed if the candidate achieves a grade of A, B or C.
Reading‏‎ – 1.30 hours where students will need to be able to understand the meaning of written English at words‏‎, sentence‎, paragraph and whole text level. Writing‏‎ – 2 hours where students will have to show they can produce a number of different items such as a short story, a letter, an article, a report or a composition, each of about 300—350 words. Use of English – 1.30 hours where students will be tested by tasks which examine how well they can control grammar and vocabulary as well as their summarizing skills. Listening – 40 minutes where students will need to show they can understand the meaning of a range of spoken material, including lectures, news programs and public announcements. Speaking – 20 minutes where students will take the test with another candidate or in small groups. They will be tested on their ability to take part in different types of interaction: with the examiner, with the other candidates and by themself.